To celebrate (if that's the right word!) 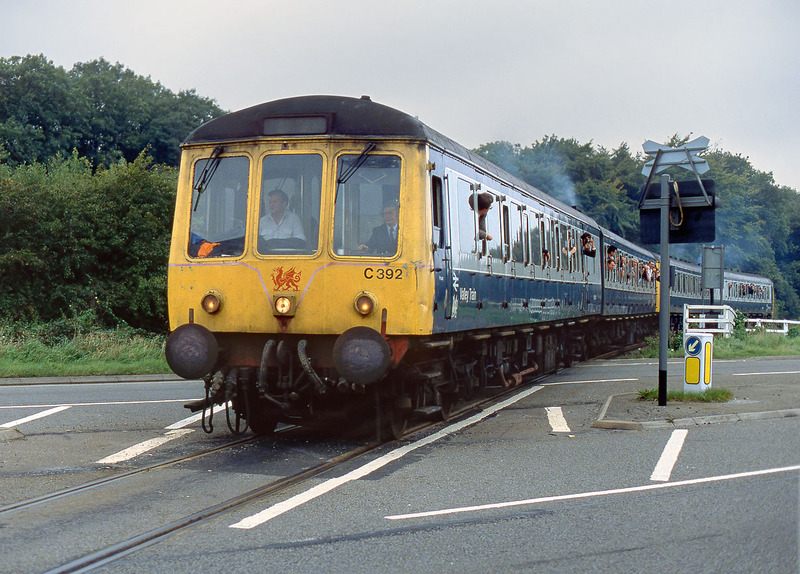 the end of heritage DMU operations in South Wales, the Monmouthshire Railway Society ran the 'DMU Demise' railtour on 26 September 1992. The highlight of this tour was a trip down the branch line into the Ford engine plant at Bridgend, an exceedingly rare piece of track for a passenger train. This involves what at first sight seems to be a very dangerous ungated crossing over the A48. With police in attendance to stop the traffic, C392 (51134 & 51147) & C395 (51133 & 51140) cautiously cross the road on their way into the plant.